Browse and purchase the latest Kung Fu instructions, books, and merchandise. 1, 6, or 12 month group classes including four, two hour classes. Packages include 5, 10, or 20 private lessons. Buy and receive complimentary 1-5 lessons. Wrights Kung Fu Association disciple training and membership dues. 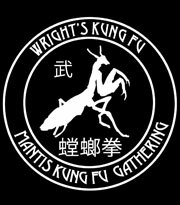 Stay tuned for the next Mantis Kung Fu Gathering. 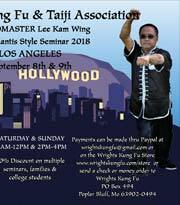 Join us on September 8th and 9th in Los Angeles for the Grandmaster Lee Kam Wing Seminar. 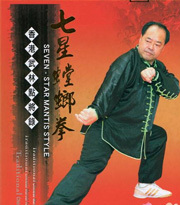 The 18 Lohan Qigong DVD covers 10 of the 18 Lohan Qigong exercises which treasure of the Seven Star Mantis Style. Grandmaster Lee Kam Wing covers the correct breathing method and postures for each routine. This DVD is in Italian. 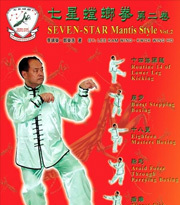 Manual by Grandmaster Lee Kam Wing containing the following routines: Yee Lo Yare Yue Kuen - Summary Boxing Routine #2, Say Lo Bung Da - Four Directional Boxing, Saam Choy Gim - Three Attainment Sword, Lok Hop Kwan - Six Harmony Staff, Mui Fa Chi Ng Gim Do - Plum Blossom Meridian Broadsword. 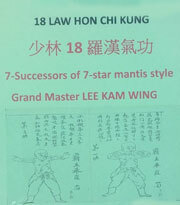 Manual by Grandmaster Lee Kam Wing containing open hand routines; 14 Roads, Burst Step, Eighteen Elders, Avoiding Force, Thrust Fist & Back Tiger Boxing Routines. 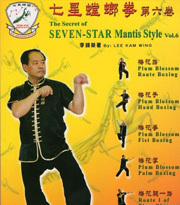 Manual by Grandmaster Lee Kam Wing containing the 5 Plum Blossom open hand routine series; Plum Blossom Route, Hand, Fist, Palm, Kick 1 & 2 Boxing Routines. 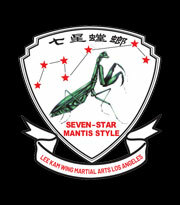 Learn the Secret of the Seven-Star Mantis Style. This book comes with a free Chi Chung poster. 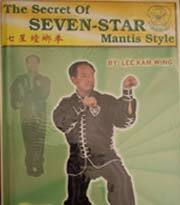 Manual by Grandmaster Lee Kam Wing containing applications, techniques, principles and fist rountines of the Seven Star Mantis Style; Big Tiger Wild Goose, 1st Essential Routine Boxing. 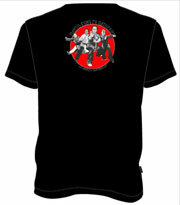 Support the Mantis Kung Fu Gathering T-Shirt with this exclusive custom t-shirt. 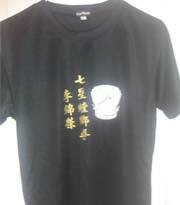 Support Wright's Kung Fu with this exclusive mantis t-shirt. 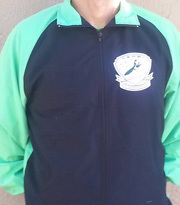 Support Seven Star Mantis with this exclusive custom jacket. 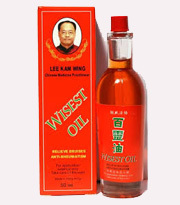 Grandmaster Lee Kam Wing's formula is a traditional remedy that relieves bruises and is an anti-rheumatism ointment. There is a flat priority shipping rate of $10 based on packages up to 2lbs. Any packages over 2lbs, as well as international shipments are premium rates. After the order has been placed, the seller will notify the buyer of the additional cost for shipping which must be paid by paypal before the items are shipped.